This authoritative continuing education course identifies the advantages of plyometric training and offers sport-specific programs to meet training and athletic goals. Plyometrics CE Course applies a science-based approach to making plyometric training an integrated, essential component for maximal athletic performance. This course uses the text Plyometrics, by Donald Chu and Gregory Myer, to help new and experienced professionals alike learn from the dynamic, practical application of the authors’ experience as well as to incorporate fresh ideas to use with clients to build the ideal program based on individual needs and goals. Included in the course are nine workouts for sport-specific training regimens, such as basketball, soccer, football, rugby, volleyball, and mixed martial arts, and 28 online video clips (access provided through a unique link found in the study guide) that demonstrate proper execution of the exercises. Professionals taking the course will also find guidance on using plyometric exercises with clients with specific needs and goals, including young and female athletes, and for injury rehabilitation. An accompanying study guide outlines the course’s learning objectives, helping to focus on the important concepts in the text. The study guide includes a table of contents, course syllabus, key terminology, chapter activities, and a referenced answer key to the study guide. This self-guided course allows users to work at their own pace and explore the material through a comprehensive text and study guide, finishing with a 75-question exam composed of multiple-choice and true-or-false questions. Understand the science of plyometrics and how to apply it in designing effective training programs. Describe the main training concepts of plyometrics and understand how to apply them in training programs for all levels. Learn a variety of plyometric training techniques and drills to develop speed, power, and agility and improve performance. Design plyometric training programs to meet specific goals for fitness and a variety of sports. Incorporate plyometric training drills and techniques into existing conditioning programs. Learn how to use plyometric training for injury prevention and rehabilitation. Develop plyometric training programs for youth and female athletes. Learn new developments and innovative techniques in plyometric training. A continuing education course for personal trainers, strength and conditioning professionals, and coaches. Donald A. Chu, PhDPT, ATC, CSCS, FNSCA, is a professor emeritus of kinesiology and physical education at California State University at Hayward, where he taught for more than 20 years. He is founder and director of Athercare Fitness & Rehabilitation in the San Francisco Bay area, which specializes in sport performance training, fitness programs, physical therapy, and clinical psychology. Dr. Chu has developed an extensive reputation in the field of sport rehabilitation and fitness and conditioning. He pioneered research-supported plyometric training in the Western hemisphere and is revered throughout the strength and conditioning community for enhancing modern sports’ most defining athletic factor: power. Chu has been credited with bringing plyometric training to the attention of coaches, athletes, and fellow professionals in sport conditioning through his application of theoretical knowledge into practical demonstrations. The author of six books, Chu has also written articles in refereed journals and contributed chapters to many books on sports medicine. 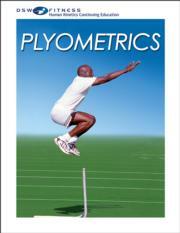 More than 140,000 copies of his seminal book on the topic, Jumping Into Plyometrics, have been sold since 1994. He has presented extensively to professional groups around the world and consulted with athletes and teams at every level—including Olympians and professionals—on the development of training and conditioning programs. Chu holds certifications as an athletic trainer (ATC) from the National Athletic Trainers’ Association (NATA) and as a certified strength and conditioning specialist (CSCS) from the National Strength and Conditioning Association (NSCA). He has served on the board of directors for both organizations and is a past president of the NSCA. He resides in Alameda, California. Gregory D. Myer, PhD, FACSM, CSCS,*D, is the director of research and the Human Performance Laboratory for the Division of Sports Medicine at Cincinnati Children's Hospital Medical Center and is the senior research advisor to the Micheli Center for Sports Injury Prevention. He maintains his primary faculty appointment in the departments of pediatrics and orthopaedic surgery in the College of Medicine at the University of Cincinnati and secondary appointments in the athletic training division at Ohio State University. He is a member, lecturer, and honoree of the American College of Sports Medicine (ACSM), National Strength and Conditioning Association (NSCA), and National Athletic Trainers’ Association (NATA) for his breakthrough research, including his defining work on the development of prevention strategies in knee injury. Myer’s work in the Human Performance Laboratory allows him to integrate the most advanced research findings into training protocols for athletic development and injury prevention. Myer works with athletes from preadolescence to professional level and speaks to coaches around the world seeking to update their own training programs. Myer is the author of Strength and Jump Training for Volleyball and several book chapters related to his research on the biomechanics of sport performance and training for injury prevention. He has also authored over 150 articles in peer-reviewed medical journals. He resides in Cincinnati, Ohio.